Colin Crouch died at home in Harrow in April 2015. He was 58, having been born in 1956 in Bushey, in Hertfordshire. He lived most of his life in Harrow and was a pupil at Haberdashers, once a chess power-house. He was a student first at Cambridge and then Durham Universities. He won the British Under 16 Championship in 1972 with 10.5/11! In 1974 he won the Under 18. Colin was a very experienced international master with a peak International Rating this century of 2448. 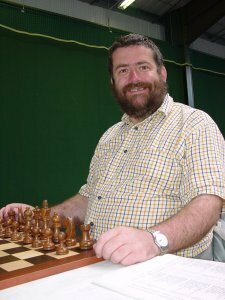 There are nearly 1000 of his games on ChessBase dating back to 1973; he having joined Harrow Club in 1970. He was first internationally rated, at 2300, in 1977, but he was not awarded the International Master title until 1991. Much of his chess was played in England, although he was also active in Scotland and played some events elsewhere. He scored 7/9 in the Hastings Challengers of 1991-1992 including a very original win over Valeriy Neverov. This result qualified him to play in the Hastings Premier of 1992-3. He did not disgrace himself in a field that included Judit Polgar and Evgeny Bareev, scoring 3½/14 in this 8 powerful double round all-play-all. At the end of 2004 Colin had a stroke from which he never fully recovered. This left him with sight only in half of one eye. He decided to concentrate more on chess following that as he wanted to prove he had recovered his intellectual capacity and felt that the logic of chess lent itself more to that ambition. He continued to play against sighted players and last played international chess March 2014 in the 4NCL. His last tournament was the London Chess Classic Open of December 2013 where he scored 4½/9. He won the silver medal in 2008 in the IBCA Olympiad on board 1. He played Board 1 for England in the Chess Olympiad for the Blind of August 2012 where he scored 7½/9, although he gave up playing against blind players as he didn’t find the opposition strong enough. Colin wrote 15 books on chess which have been well-received. The most recent is ‘Magnus Forces – How Carlsen beat Kasparov’s Record’. He learnt to use a computer for this purpose and after he became partially sighted, used the only type-face he could read. He also coached chess, particularly at Pinner Junior Chess Club. He designed a very specialised Crouch Swiss Pairing System. It was used around 2000. It never caught on: people distrust anything new; it is heavily reliant on accurate ratings; the two top players may meet as early as round 2. Thus he was something of a polymath. His Ph.D thesis was on ‘Economic Geography of Recession in the UK; the early 1980s and historical perspective’. So much happened in that period in England that it ended up as three very large A4 volumes and wasn’t completed until 1989. He was also politically active. He predicted the recent bust and also the breaking-up of the British two-party system.